I have written before about how much I admire Bob Griese. As a kid, he was almost a default hero as the Miami Dolphins quarterback. But as the years passed, when things beyond sports matter more in how you think about people, Griese, a fellow Catholic, remained admirable. The Davey O’Brien Foundation announced Boilermaker icon Bob Griese as the recipient of the 2010 Davey O’Brien Legends Award, which recognizes a college or professional quarterback who has made a significant contribution to the game of football, distinguished himself as an extraordinary leader and demonstrated exemplary conduct on and off the football field. The legendary broadcaster is also very committed to giving back to the community. He serves as Chairman of the Board of Advisors of the Moffitt Cancer Center, is a Board member of the Don Shula Foundation, and is a senior member of the Orange Bowl Committee. He is a devoted supporter of Judi’s House, and he has endowed a football scholarship at his alma mater, Purdue University. Article referenced is copied in full at end of post. Boilermaker icon recognized as a quarterback who has made a significant contribution to the game of football, distinguished himself as an extraordinary leader and demonstrated exemplary conduct on and off the football field. FORT WORTH, Texas – The Davey O’Brien Foundation announced Boilermaker icon Bob Griese as the recipient of the 2010 Davey O’Brien Legends Award, which recognizes a college or professional quarterback who has made a significant contribution to the game of football, distinguished himself as an extraordinary leader and demonstrated exemplary conduct on and off the football field. The award will be presented at the 34th Annual Davey O’Brien Awards Dinner on Feb. 21, 2011 at The Fort Worth Club in Fort Worth, Texas. Griese joins a prestigious list of recipients which includes Dan Fouts (2009), Joe Theismann (2008), Steve Spurrier (2007), Paul Hornung (2006), Len Dawson (2005), Archie Manning (2004), Terry Bradshaw (2003), Bart Starr (2002) and Roger Staubach (2001). “I am honored to receive the Legends Award and to be mentioned with some of football’s greatest quarterbacks,” said Griese. The standout quarterback from Evansville, Ind. earned All-American honors at Purdue where he threw for 4,541 yards and 28 touchdowns. 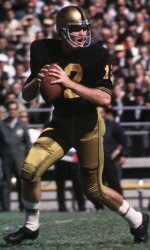 Griese led the Boilermakers to three consecutive winning seasons from 1964 to 1966, including the 1966 Big Ten championship and the school’s first appearance in the Rose Bowl, where they defeated USC 14-13. Griese, known as the “Thinking Man’s Quarterback,” was drafted by the American Football League’s (AFL) Miami Dolphins in 1967. He went on to help lead them to three consecutive Super Bowl appearances, including back-to-back championships in 1972 and 1973. An AFL All-Star during his first two years, Griese was named consensus All-Pro quarterback in 1971 and 1977, made six appearances in the Pro Bowl and was voted the Dolphin’s Most Valuable Player six times by South Florida media. During his 14 pro seasons with the Dolphins, he threw for 25,092 yards and 192 touchdowns. He also rushed for 994 yards and seven scores. Griese’s accomplishments were celebrated with his induction into the College Football Hall of Fame and Indiana Football Hall of Fame in 1984 and into the Pro Football Hall of Fame in 1990. His No. 12 jersey became the first in Dolphins’ history to be retired. After retiring from the NFL, Griese began his career in broadcasting in 1982 as a NFL analyst for NBC Sports. In 1987, he was hired as a television commentator for college football on ABC and ESPN. Griese has three sons, and he and his wife, Shay, live in Jupiter, Florida. About The Davey O’Brien Foundation The Davey O’Brien Foundation (the Foundation) was founded in 1977 to honor and remember the strong character and leadership of football great, Davey O’Brien. Widely known for its Davey O’Brien National Quarterback Award®, the Foundation recognizes champions on and off the field through national awards programs encouraging academic and career success. The Foundation has given away more than $800,000 in scholarships and university grants to help high school and college athletes transform leadership on the field to leadership in life. More information about the Foundation can be found at http://www.DaveyOBrien.org. This entry was posted in Catholic Faith & Inspiration and tagged Bob Griese, Miami Dolphins, Purdue University. Bookmark the permalink.